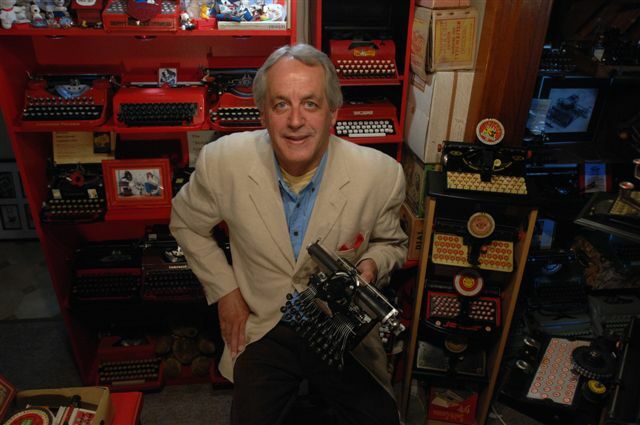 Being bunged up with a bad case of RSI, and seriously limited in what blogging and emailing I can do, has given me the chance to work on some typewriters. Just odds and sods - a motley crew, I'm sure you will agree. This metallic grey Royal Companion, a Dutch-made Royalite twin, needed to be completely taken apart and fixed from the very base up. I will post on the step-by-step progress of that work soon, but in the meantime let me just say that the key to getting it fully functional again was grommets - in some cases improvised from the remains of the almost completely perished originals, in other cases "created" from scratch. I was glad that the seller readily conceded it was not "in good working order" (as listed; it couldn't type the way it was) when she sold it, and offered a refund - of which I accepted half. Talking of Royal model name variations, I was interested to see this Royal Caravan listed on US eBay. It is, of course, nothing like the Bob Dylan Royal Caravan, but a renaming of the very common Triumph-Adler Tippa, designed by Toshihiko Sakow and made for Litton Industries in Holland. In a post on various Czech-made Consuls a week or so ago, I neglected to include this Hanimex variation of the Consul 232. I later came across it in storage. Hanimex is another Australian brand name which might cause some confusion overseas, as Lemair-Helvetia does. Hanimex was an Australian distributor founded by Jack Hannes after World War II. The name is a contraction of HANnes IMport and EXport and the company imported European and Japanese camera equipment and typewriters. Hannes apparently sought low cost providers, but in the case of the Czech Consuls, these are fairly sturdy, reliable little machines. These Hanimex models come up quite regularly on Australian eBay. So, too, do other Consul 232s rebranded, as I mentioned in the Consul post, as Majestic or Highness. Eventually, like the Hanimex above, and the Consuls and Maritsas from Bulgaria rebranded as Pacific and Waverley, the relabelling was done on the super cheap. 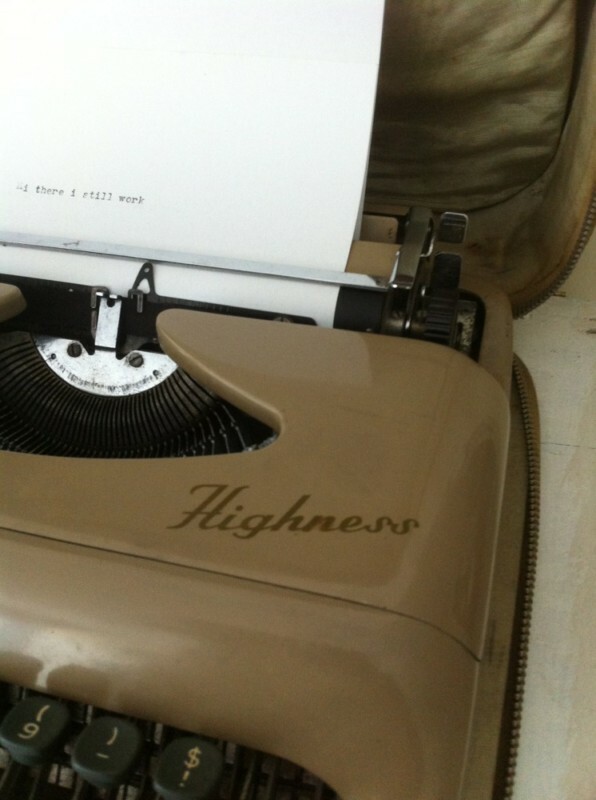 But earlier, the Majestic and Highness had an almost tasteful gold script decal. I do hope my Swiss friends will find my relabelling of this old Hermes Baby at least vaguely tasteful. This machine was given to me a year or so ago and was in a dreadful state. So bad I left it in its case in the shed for many months. But this week I decided to take it out and work on it. 1. The "i" typeslug was floating around inside the machine and needed to be reattached. 2. A burnt matchstick, broken in half, with the two bits shoved in either side the front segment section - for what purpose I do not know. 3. There were ugly, roughly hewn tufts of felt stuck to the bottom front corners of the base. 4. This presumably was once a front feed roller or paper support? Also floating around inside the machine. 5. An awful, extremely amateurish job had been done of painting the keytops. Dirt and corrosion were EVERYWHERE to be seen! Of the little paint that was left on it, I could see it was originally black. I asked Georg Sommeregger about this, and he confirmed some Babys were sold in black (its serial number, by the way, is 244268). I decided it had to be repainted, and to paint it in its original colour, using a plastic texture paint. But only after cleaning up the mechanics - which, as can be seen above, were in a diabolical condition. And also replacing most of the keytops (I may get around to replacing them all, for consistently sake). On the subject of what started life as a Hermes Baby, some may recall my "temporary transformation" of a Baby to an "Empire Aristocrat" for the purposes of a movie being made in New Zealand about Sir Edmund Hillary's conquest of Mount Everest in 1953. 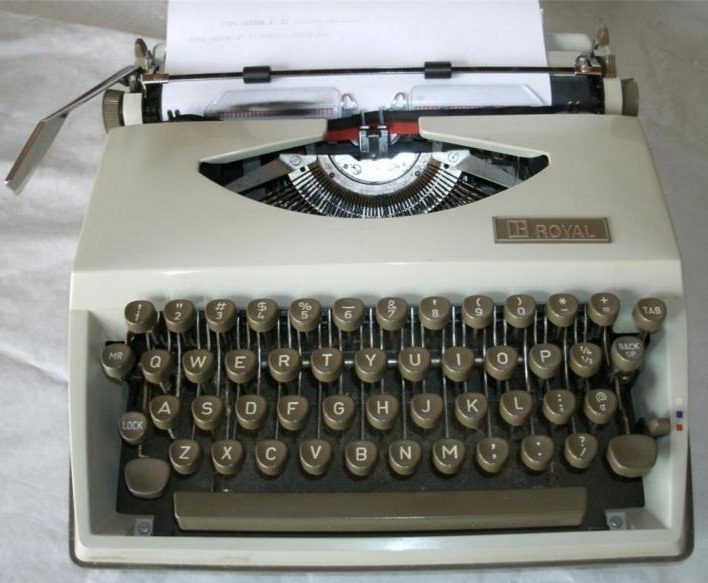 The typewriter is now winging its way with Fed Ex to Auckland and on Friday week will be loaded in the props truck headed for filming at Mount Cook, near my hometown. It now has the Aristocrat's red keys for margin release and back spacing, as well as the faux decal. I was also expecting to be posting a Brevitype stenography machine and a salmon Olivetti Lettera 22 this week. However, after going to the trouble of getting shipping quotes for both items, scanning them and emailing them a fortnight ago, the owner of the Brevitype (not the one in Romania, who bought it, but the one in the US, who sold it) decided he didn't want it back (God only knows what became of "my" pale blue Royal portable). The buyer for the Lettera 22, in Singapore, hasn't replied one way or the other, so I guess it will going elsewhere now (or staying here for the time being). A surprise arrival this week, but a pleasant one as it turned out, was this Underwood 310, which, given it is an Olivetti Dora, actually types quite well. I look forward to getting further use out of it. The sender said, "Don't bother about the case", as, in a common fault with the Olivetti vinyl case, the spine was completely broken. Nonetheless I found a use for it. I discovered that if you place a Dora (or Underwood 310) on a rickety old vinyl Olivetti case, it will type better than it will on a firm surface. Maybe there was a good reason why Olivetti made these cheap and nasty, awful cases. Finally, a typewriter that has brought me nothing but bad luck. Does anyone else own a "jinxed typewriter"? This one, I fear, has a "Mexican curse" on it. It's a Sears Courier, a Lettera 22 made by Olivetti in Mexico in, I think, the early 60s (or maybe the late 50s?). It's easy to see the mask is buckled on the front left and the ribbon spools cover doesn't sit properly on the left side. It's had a serious fall or three, I fear, and the back is bent as well, meaning it doesn't type very well at all. I've been thinking about buying another one in the US - but are they all cursed? A bit of advice on bent masks or ribbon covers - NEVER, ever try to ever so gently manipulate Olivetti aluminium sections back into shape. They will break in half. I know. Been there, done that. 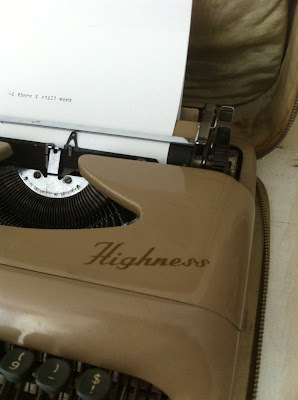 It's always great to see typewriter repairs, and I think what you have done with the Hermes "Aristocrat" is great. Very neat job! You've certainly had quite a bit of typewriter traffic chez Messenger. Nice fix-up to the Hermes. Maybe you could rent it to them as a shop window prop! That poor little Hermes! I very much like your restoration job. I'll try to remember your advice about Olivetti aluminum parts. Your new Hermes color-scheme seemed very odd at first glance - but the gold on black is growing on me. Well done! Very nice new label! For typewriter historians' sake of later generations, you should give it an additional mark on the bottom saying that you restyled it in 2013 - or something similar. Just to make sure noone discovers an exceptionally rare ultra-atomic unique specimen of Hermes Baby in 50 years time. Hi, I'm trying to find out a bit more about a typewriter I bought at a garage sale recently and it looks to be the same as the Hanimex Consul you've pictured. The guarantee with it claims it's a "HX MODEL 1531" and the previous owner said their father used it working as a chemist. Along with the guarantee card there's also the instruction manual and carrying case. When would it have been made? And what happened to Hanimex? Is it hard to get replacement ribbons? The typewriter itself is pretty clean and works well enough; but the case is looking a little grubby. Would taking some soap and water to it be okay? I'm not a collector; I just like the novelty of thing and I'm curious about it's origin (also my handwriting is terrible and it would be fun to try typing out letters and the like). Any information you have would be most helpful, but there's no pressure. HX would suggest it is a Hanimex. Does it not have a brand or model name on it? I can't advise on ribbons unless I know which country you are in, but if it is Hanimex I assume you are in Australia, where ribbons are readily available. If I do a search on my blog using the word "Hanimex" you will find what became of the company in other posts. It mostly imported cameras, from memory. Re Hanimex, a Google search for Jack Hannes might help. Thank-you, lots of good info. It does say Hanimex in the top and I am in good old Aus. Good to know I can get ribbons easily.